The baking ban is over thanks to being on cake duty at work for this month's birthdays. Unfortunately I didn't have the time to bake something spectacular, but it was a blessing in disguise as this cake is wonderful! 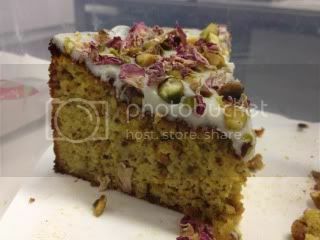 It is deliciously moist, however remains light unlike other flour-less cakes. For once I actually followed a recipe! 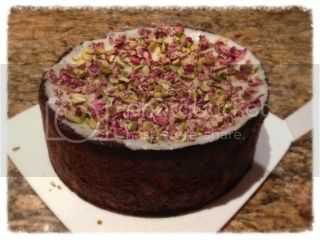 Actually, I lie, instead of drowning the cake in a syrup, I made a simple glace icing and topped the cake with rose petals and pistachios. Apart from that it is as per the recipe. To save time I boiled the oranges the night before, blended them and left in the fridge. This meant that it took me only 5 mins to prepare the ingredients, 10 minutes to make the batter and 60 minutes to bake the cake. Easily achievable after work. All in all I highly recommend this cake. It is gluten free, dairy free, not super sweet and moreover absolutely delicious! A definite keeper.